The simple way to wilderness. The unique rapids and waters of the Ljusnan River are a great place to experience the feel of swinging a fly or spin rod. The river runs in a valley offering fantastic natural settings. Our campsite lies only a few metres from running water and you stay in cosy cabins with self-catering. This fishing spot is known for excellent fishing for grayling and brown trout. Especially during spring and the night fishing in summer. In the area you will find a great variety of fishing experiences. You can go wading and fly fishing in the rivers. Perch and pike are found in most of the lakes nearby. By the endless amount of minor lakes and woodlands you can come very close to nature and be all alone. We have lots of minor creeks and brooks perfect for fishing with light equipment. If you want to go angling you can find roach, bream, ide and common whitefish amongst others. For more fishing information, visit www.ljusdalsfvo.se and www.farilafiske.se The camp is open from May 15 through October 15. 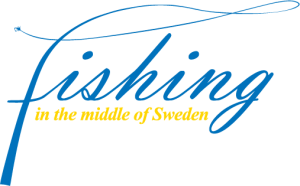 We offer guiding by an experienced fisherman who knows the Ljusnan River streams well. 3 hours drive by car from Arlanda Airport.